For those who follow me on Twitter or the FTHOQ Facebook page, you already know I share a lot of images on the history of medicine. I’ve come across many of these images while browsing through online archives collection data for my research on experiences of hearing and hearing loss in twentieth-century America. I’m particularly interested in the cultural history of deafness from a medical standpoint and frequently find myself drawn to all sorts of representations of hearing, sound, and artefacts. Sometimes I come across a new digital archive by clicking on a link on the one I’m already looking through, and off I go, spending hours carefully scrolling through images and records. I initially started sharing images on the history of medicine (#histmed on Twitter) as I conducted research in London on materials related to my dissertation. I expanded my postings when I started collecting materials for my course on the History of Medicine. I kept a file on my desktop of remarkable sources of images and objects I hoped one day to share with my students. There were many that never made the cut for lectures and I wanted a platform to share them—hence, I started posting on my Twitter account and later created the FTHOQ Facebook page to post additional details that went beyond the 140-character limit. I aim to post as much details on sources and archive repositories as I can, but sometimes I find great things on Google Images that have no additional data and I post the image in the hopes someone else can fill in the blanks. Sharing images has been a great way for me to participate in fruitful conversations about cultural frameworks of health and healing. At the back of my mind, I’m overly aware of the risks of decontextualizing these images and using them for “entertainment.” Daniel Goldberg drew my attention to a great post written by Richard Barnett for the WellcomeLibrary blog. Barnett discusses some of the ethical concerns he encountered while writing his book, The Sick Rose: Disease and the Art of Medical Illustration (2014), particularly on the implications of looking at pictures of people’s suffering and diseased bodies. Is it appropriate? Another form of entertainment? Barnett raises crucial issues that I think all historians should think about when we share images of bodies with an audience. 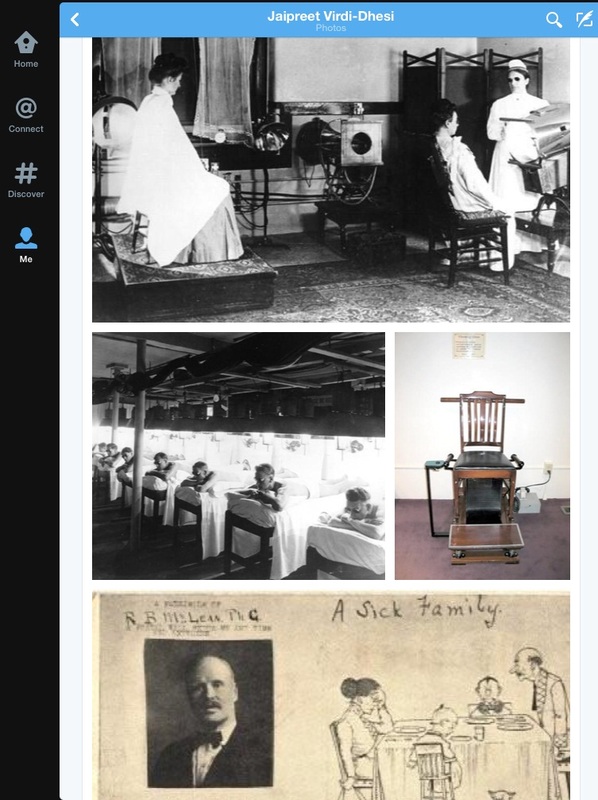 I might say that I share these images—and some that even I find gruesome enough to warrant a “WARNING” or “SENSITIVE” prelude on my tweet—as a way to educate my audience on the horrors of medical practice, but even I cannot ignore the shock element that is clearly embedded in that tweet. Especially when it comes with a warning note. Barnett expresses: “I might comfort myself with the thought that I am deepening my readers’ understanding of these images by setting them in context.” Too often, I’ve come across images that have been grossly misinterpreted or miscategorised. Many more do not identify the source or provide any context. Setting them in context almost provides merit for sharing them: I’m not just passing them around, but trying to address their historical place and value. The most interesting discussions and that arise from sharing these images come from my audience, whose inquisitive questions inspires me to ignore my to-do list for the day and dig up as much information I can about a particular image. But what happens when we don’t provide the context of a particular image? Have we stripped away its meaning? The popularity of twitter handles like The Retronaut or HistoryPics indicates that people love looking at the past; but too often errors are pointed out. I haven’t kept a precise analysis of the images I’ve posted and how they were shared as an indicator of how people are “reading” the images and learning from them. My audience is not wide enough for that. But I have been aware of the thoughts that go behind my postings and how I’ve been aware not to offend, decontextualize, or even muddle the historical merit of these images. Last summer I kept a schedule based on particular themes I would post in relation to the research I intended to do. For instance, I would post images on epidemic diseases in India one week, prosthetic artifacts the next, and so forth. I had scheduled surgical amputations the same week the Boston Marathon bombings occurred. Of course none of these images were shared at that time; it seemed cruel, insensitive, and above all, opportunistic. are, to borrow a phrase from Claude Lévi-Strauss, good to think with…They should shock us, move us, jolt us out of any sense of complacency over our individual or collective well-being; something would be wrong if they did not. They are a magnificent historical and aesthetic resource, and a record of human suffering and of attempts to understand and to relieve it. We would be all the poorer if they were concealed; equally, they should not become mere visual shorthand for a kitsch, knowing and emptily ironised attitude to sickness, suffering and death. I’m glad people like how I share images. The repositories I come across are wonderful and as a scholar, I’m thankful to all the individuals who have digitized these images, allowing me to get a better glimpse into the past.